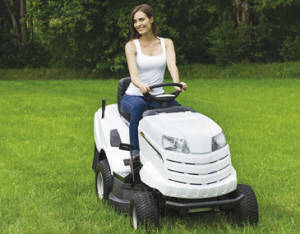 Sit comfortably and easily take care of your garden with the high specification Alpina AT792 ride on lawnmower. The Alpina AT792 HCB is suitable for medium to large gardens of up to and slightly over an acre in size. the Alpina AT7 92 HCB is a sturdy, rear collecting tractor lawn mower featuring a solid 92 cm / 36 inch double blade cutting deck with twin contra-rotating blades and 7 different cutting heights engageable by electromagnetic clutch. 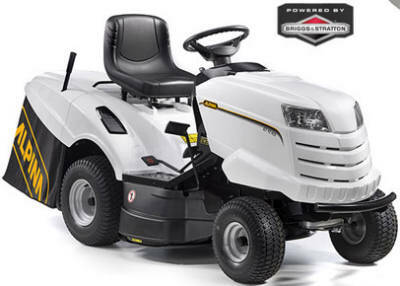 This mower is powered by a powerful 500 cc Briggs & Stratton engine with pedal driven hydrostatic transmission for effortless control in forward or reverse. This high spec mower comes with an ergonomic steering wheel, high back support seat, 290 L grass collector and front headlights to allow night work. It includes the battery charger and the front bumper for added protection. Mulching kit and trailer hitch available as accessories.